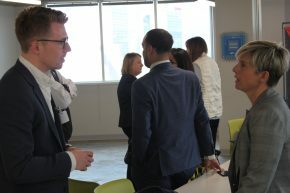 The attendees included the participating entrepreneurs, mentors, and staff of CO.LAB that has organized the 10-week program along with Erlanger, the nation’s 10th-largest public healthcare system, and Unum, a Fortune 500 insurance company. 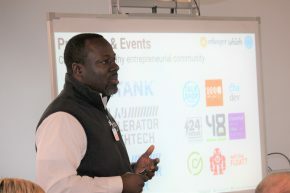 Describing it as “an incredible opportunity” for the eight start-ups, CO.LAB’s Chief Executive Officer (CEO) Marcus Shaw (pictured left) called-out the two sponsors and two law firm partners – Miller & Martin and Chambliss, noting that launching the accelerator would not have been possible without their commitment. Collectively, the four organizations are providing about two dozen of their employees to serve as mentors for the teams. The mentor who travelled the greatest distance was a Unum executive who came from Portland, ME. As each of the mentors did a self-introduction, it was clear that this was not the first start-up experience for many of them. In fact, several cited their previous involvement either starting or being part of a new venture, and all seemed genuinely excited about helping the teams. “Our goal is to help you to increase your customers, your capital, and your capacity,” Shaw told the eight teams during his introductory comments before turning the program over to Jennifer Skjellum, CO.LAB’s Director of Programs. She will be coordinating the activities leading up to Demo Day on June 5. The eight teams run the gamut from those just getting started to some that have been in business for eight years. There will be a “Meet the Companies Mixer” on April 17. Healing Innovations, a recent graduate of the Life Science Mentor Network, has developed the “Rise&Walk” device designed to provide gait training for patients who have experienced an injury or diagnosis that has led to paralysis or a walking impairment. 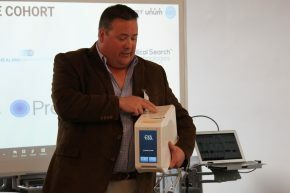 Luke Benda, President and Co-Founder (pictured left with Skjellum), said there are only two solutions currently available, and the “Rise&Walk” device is less costly and more effective. KelCor LLC, a company co-founded by Cory Allison of Chattanooga’s The JumpFund, is developing a single use tape dispensing system to reduce infection risk during surgery. She said the start-up is in the final stages of having its prototype developed. PreTel is focused on reducing the number of newborns that end-up in the neonatal intensive care unit due to early labor and delivery. Marc Finch, Founder and CEO, said the company is based on understanding the physiology of the uterus and a wearable device with sensors that enable the monitoring of a woman to avoid unnecessary C-Sections and early labor. Medical Search Technologies, co-founded by Jan Sevcik, has developed a natural language processing and information extraction technology for the healthcare industry that creates structured data from raw, unstructured text files. These are same types of text files found in electronic medical records, pathology reports, PubMed and many other medical data warehouses. Canopy Innovations Inc. is a digital company that has developed a suite of products to enhance communications between Spanish speaking individuals and medical professionals. In business for about five years, the company has three products on the market. MedX Services that is using a device named Spencer to handle dispensing of prescriptions at senior living facilities. As described by Founder and CEO Ken Lowden (pictured right with Spencer), the multi-faceted device includes a medication calendar and smart reminder system that integrates with most mobile and smart devices in real-time to help keep patients on track with their medications. It also records missed doses, then works with the patient’s pharmacist to ensure that the patient and caregiver are informed and making the necessary adjustments. Rhinogram was launched four years ago to address the preference of many patients to communicate with anyone, including their healthcare professionals, through texting rather than emails or portals. The start-up offers a HIPAA-compliant system.